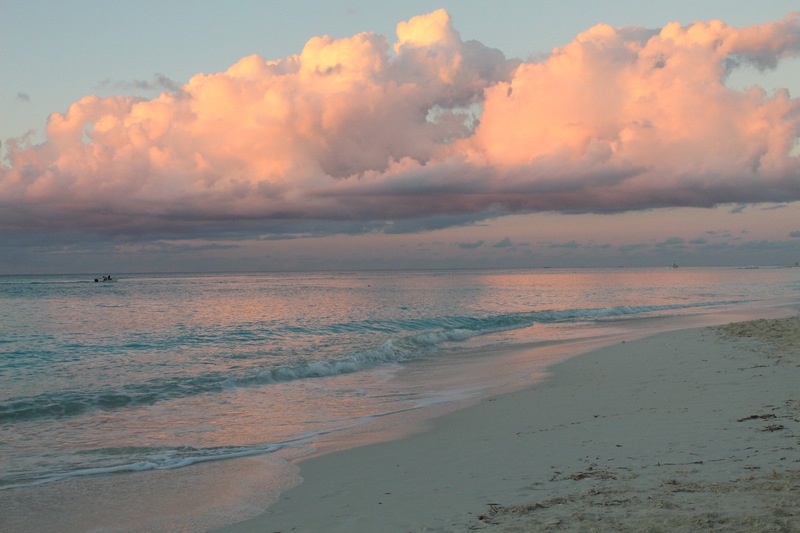 Wow—what an incredible and hectic month its been here in Turks and Caicos! When Breanne and I first arrived on January 4th, I could not believe how beautiful it is here and how fortunate we are to be given this opportunity. The first few days as interns for the Turks and Caicos Islands Rugby Football Union were a bit of a whirlwind. It was very difficult at first trying to conceptualize our role as interns in a new environment while immersing ourselves in a new culture that is different from our own. 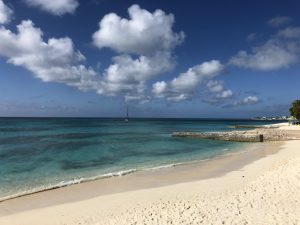 Despite moments of feeling a little overwhelmed, we made sure to enjoy our introduction to this beautiful island by taking full advantage of its incredible beaches and amazing weather. 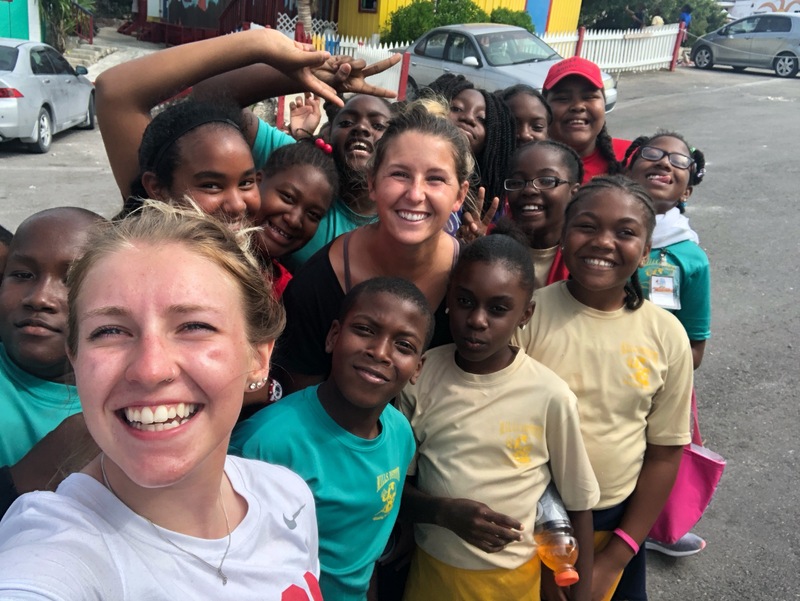 Such a fun rugby session with a group of 70 students from Ona Glinton Primary School on Grand Turk Island that we visited in preparation for the Inter-Island Tag Rugby Tournament. This year Turks and Caicos will be hosting the Inaugural Inter-Island Youth Tag Rugby Festival. This is expected to be the largest sporting event to happen in the TCI. This festival will host multiple islands in TCI that do not have experience with a tournament of this magnitude and historically rugby has not been a very popular sport in all areas. 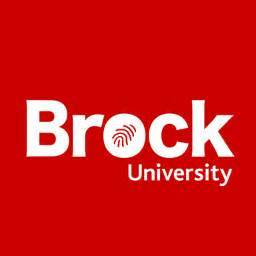 This event is multi-faceted, and preparing for the event is one of our main tasks as interns. We will begin by introducing and increasing interest in the sport by travelling to various schools and teaching youth the foundations of rugby. We have been encountering many struggles when engaging students and trying to motivate them to participate in the program. This may take time for them to gain trust in us as newcomers to their home, but we have seen so many improvements in the student’s abilities and interest in taking part in school sessions and our Saturday Youth League. 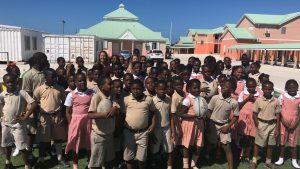 One of our very enthusiastic groups from Mills Institute in Providenciales. 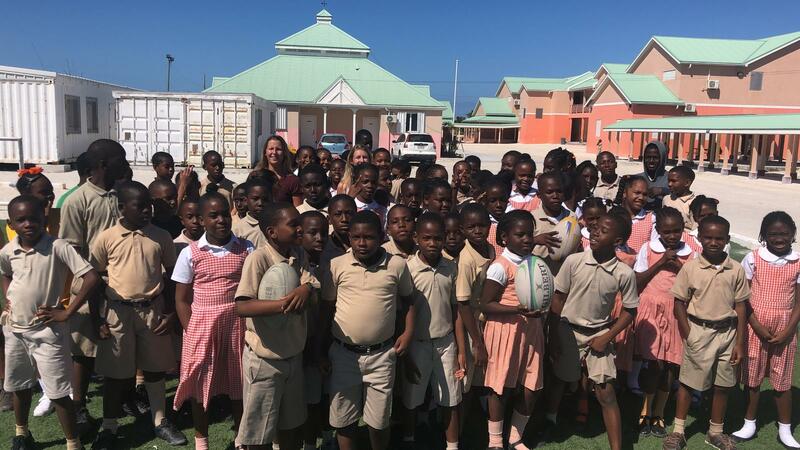 I have been in awe of the hospitality and kindness that has been shown to us while visiting the schools and interacting with the Turks and Caicos Islanders. One moment that has stuck with me was during our first week when one morning, Breanne and I got completely lost on our way to a school. Unable to even find an address to enter into a GPS, we asked a local store owner for directions. This woman not only helped give us an understanding of the area we were in, but she completely stopped everything, got into her car and drove us to the school we were looking for. Almost every day we experience a moment where we are left speechless from what are likely just everyday pleasantries between people of TCI. We see these values represented by the kids that we coach. Often, we are unable to leave a rugby session without being bombarded by all the kids in the class wanting to get a big group hug before we leave or asking us to come back soon. We are thankful everyday for the opportunities that have been made available to us and the people we get to share them with. Breanne and I at Meridian Field (our home away from home), where all rugby programs take place. Despite being very busy with our work responsibilities, Breanne and I have found the time to get out and experience this new land in a more informal way by heading out to various snorkelling sites and partaking in some other water sports offered on the island. On Thursday nights we play in a tag rugby league with co-workers and members of the local rugby community, which has been one of the best ways for us to meet and connect with new people. I recently started volunteering with the local hockey league, which has been such an incredible experience getting involved with a sport I’m very passionate about in a place I never expected to see it! There is never a dull moment in TCI with all the options we have to get involved in the community and with the beautiful islands we are just beginning to explore. It is hard to believe we are already one month in, and we cannot wait to see what the next two months have in store for us!